The CSP award scheme aims to reward young swimmers in their first years of competitive swimming, encouraging them to focus on their strokes, turns and finishes, as well as speed in order to achieve better swim times for each stroke. 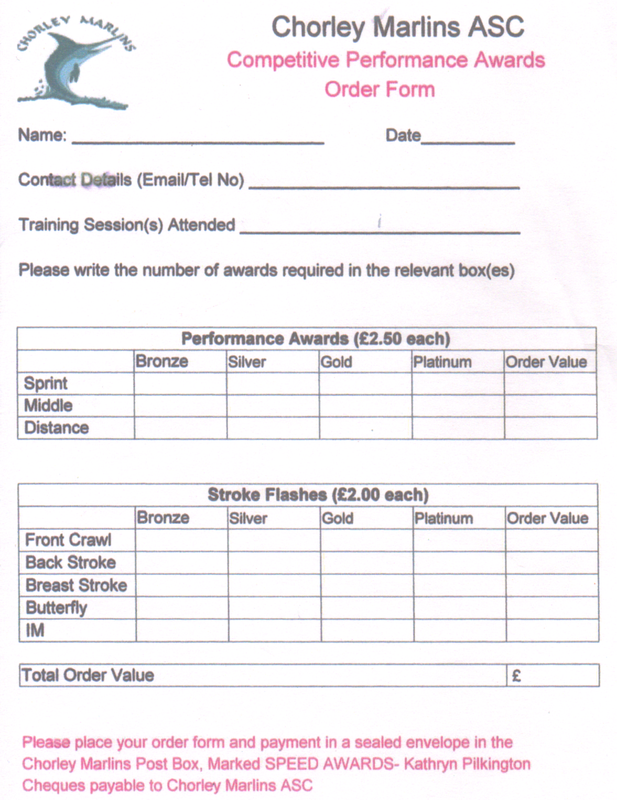 Times for each stroke are graded at 4 levels: Bronze, Silver, Gold and Platinum. Once a swimmer achieves or breaks a time for any stroke at that level they can claim a cloth badge which relates to the distance (ie Sprint Bronze Award) and the relevant stroke flash (ie Bronze Butterfly Flash). Swimmers can track their progress by collecting further flashes as times are achieved for each stroke at that distance. The awards can be achieved in competition or at organized time trials. 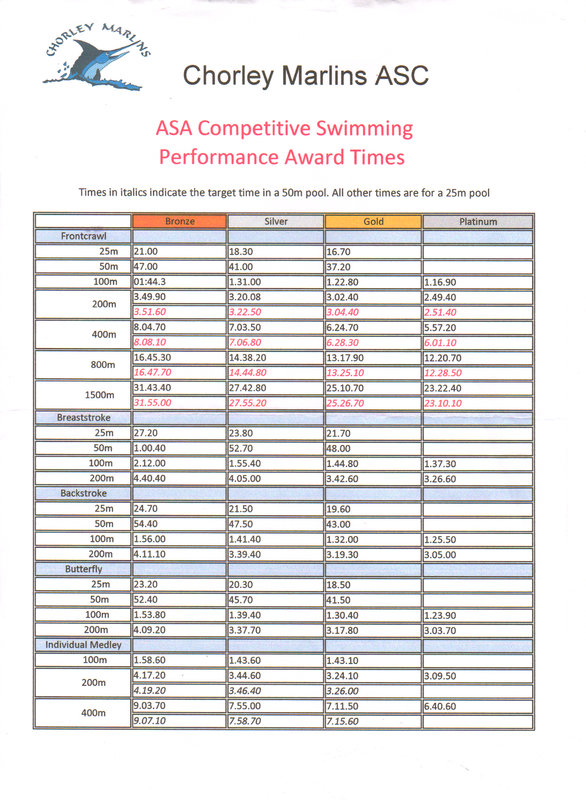 The performance table below shows the length of the pool, distance, stroke and times required to achieve these awards. A list of swimmers that achieve these times will be posted on the notice board. The CSP awards can be purchased from the club. Please place your order form and payment (cheques payable to Chorley Marlins ASC) in a sealed envelope labelled ‘CSP Award Order’ and post in the Chorley Marlins post box. 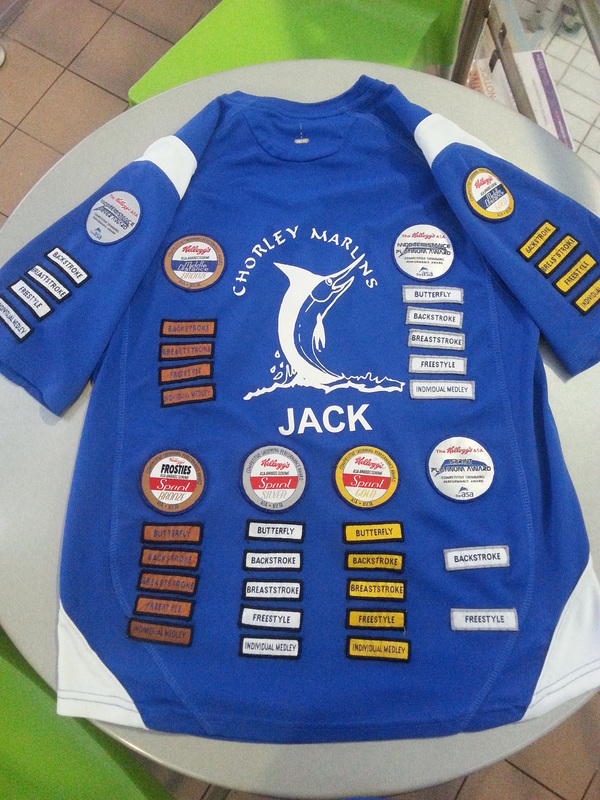 Here is an example of where and how the awards can be sewn on to the swimmers T-shirt, showing the different grades and strokes achieved by the swimmer.